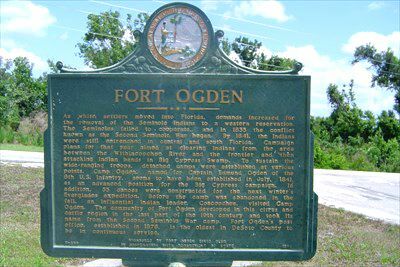 Fort Ogden, Florida was a U.S. Army post established in 1841 during the Second Seminole War in present-day DeSoto County. As white settlers moved into Florida, demands increased for the removal of the Seminole Indians to a western reservation. By 1841, the Indians were still entrenched in central and south Florida. Campaign plans then aimed at clearing the Indians from the area between the Withlacoochee River and the frontier and then attacking Indian bands in Big Cypress Swamp. Fort Ogden was established in July 1841 as an advanced position for the Big Cypress campaign. It was built by Captain T.P. Gwynne and four companies of the 8th U.S. Infantry and named for Captain Edmund A. Ogden of the same infantry group. While the troops were there, they constructed 55 canoes for the next winter’s Everglades expedition. The fort was the site of a meeting between Seminole chiefs, including Coacoochee, and Colonel William J. Worth, the commander of the Tampa District, in May 1842. When they would not agree to removal, they were forcibly taken to Fort Brooke to be relocated. The fort was short-lived and was abandoned in 1842, at the end of the war. Later, the community of Fort Ogden developed in the last part of the 19th century and took its name from the fort. A historic marker designates the site of the fort in front of the post office on U.S. 17 in Fort Ogden, Florida.